On February 25, 2016, NASJE’s Northeastern Region sponsored a webinar for NASJE members entitled Procedural Fairness for Court Staff: A Brief Curriculum for Teaching, facilitated by Kelly Tait, Immediate Past President of NASJE, and Joan Bishop, NASJE Northeastern Region Director. About 55 people participated in the webinar. It was a very quick-moving and informative exploration of how and why judicial branch educators should include the topic of procedural fairness in education programs for court personnel as well as judges. Kelly Tait spent time up front talking about the importance of getting buy-in from court personnel when approaching the topic in an educational setting, and she offered several examples of ways that could be done. For instance, a string of video clips related to poor customer service showed how frustrating (if not infuriating) it can be when customers are not served fairly and effectively. The video clips helped to put us in the shoes of a court user who might be angered by a perceived lack of fairness. 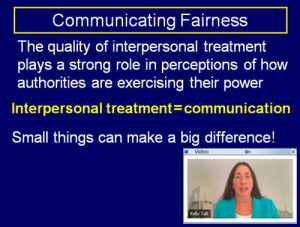 Drawing examples from the learners and using analogies such as the alienating and intimidating use of specialized medical language by health care professionals are also effective methods of letting learners know why procedural fairness is important. The facilitators explained procedural fairness as whether or not people experiencing the justice system perceive the procedures used and the interpersonal treatment they received as fair. The aspect of “perception” in this brought to mind judicial ethics, as all court personnel must avoid impropriety as well as the perception of impropriety in the courts. Likewise, we can’t disregard the perception of the court user when evaluating procedural fairness. The four key components of procedural fairness are (1) Understanding (Is there an understanding of court and the process? ); (2) Voice (Are court users being heard? ); (3) Respect (Do court users feel they’ve been treated with respect and dignity? ); and (4) Neutrality (Is the court providing a neutral forum?). Helpfulness was also discussed as a related aspect that is relevant to court personnel. This explanation provided a very well-rounded picture of what judicial branch educators should be concerned with when considering procedural fairness. Procedural fairness should be exhibited (and embraced) by all members of the court staff. Court staff have more contact with court users and experience a one-on-one exchange of information. If the court and the court staff have dealt with users fairly, then those users are more likely to cooperate, be pleasant, provide information, accept decisions, comply with orders, and leave with a positive perception of the court system. Joan Bishop discussed some of the barriers to court staff providing procedural fairness. These include personal biases and stereotypes as well as a lack of time due to a high volume of cases and people they are working with. These barriers led to some valuable discussion with webinar attendees, spurred on by questions developed by Northeastern Region members. All participants agreed that including this topic in court educational programs is vital, and participants discussed the different models, group sizes, and methods that might be most useful in talking this topic. Facilitators provided several resources including an excerpt of a toolkit for measuring perceptions of fairness by Emily Gold LaGratta of the Center for Court Innovation and a list of relevant websites and publications. This was a useful webinar on an important topic, and NASJE thanks the Northeastern Region for sponsoring it. A few months ago, I asked a roomful of judicial educators whether they considered themselves court leaders. A surprisingly small number of people raised their hands to indicate that they saw themselves in this manner. I think to an extent their response was indicative of their acknowledgement that they did not sit atop the chain of command in their administrative structure. However, if that is to be the determinative factor, then very few of us are court leaders. I prefer to think of being a court leader as being able to have an impact on the direction the court will take and the way the judiciary will achieve its objectives. Seen from this perspective, I think it is undeniable that most of us are court leaders. At the recent 2018 NASJE Annual Conference in Austin, Judge Edward Spillane delivered a session on the humanity of litigants. Judge Spillane is the Presiding Judge for the College Station Municipal Court in Texas. He started his session by explaining that change in a court’s treatment of litigant too often occurs as a result of an unexpected, often catastrophic, series of events such as those in Ferguson, Missouri. The final morning of the NASJE conference in Charleston, South Carolina began with the choice of one of three different breakout sessions. I chose to attend Facilitating 101 presented by Stephanie Hemmert of the Federal Judicial Center in Washington, DC. She began the session by drawing input from many in the audience, who shared various reasons why they wanted to facilitate classes, discussions and meetings. She then went on to explain that our purpose for the class was to practice our facilitating skills with the whole group. Are you in the news? and we will add it to our news page. NASJE would like to extend a very special thank you to the State Justice Institute (SJI) for our partnership history and their generosity! NASJE is the recipient of two SJI grants: 1) to support our annual conference education, and 2) to develop a curriculum (i.e., an overarching educational plan) for judicial branch educators based on NASJE’s core competencies! Copyright © 2019 NASJE. All Rights Reserved. The Magazine Basic Theme by bavotasan.com.